I have a deep interest in the less contacted or isolated tribes of the planet. I am not saying they are un-contacted, I am saying for the most part; they do not want contact with what we call the civilized world. 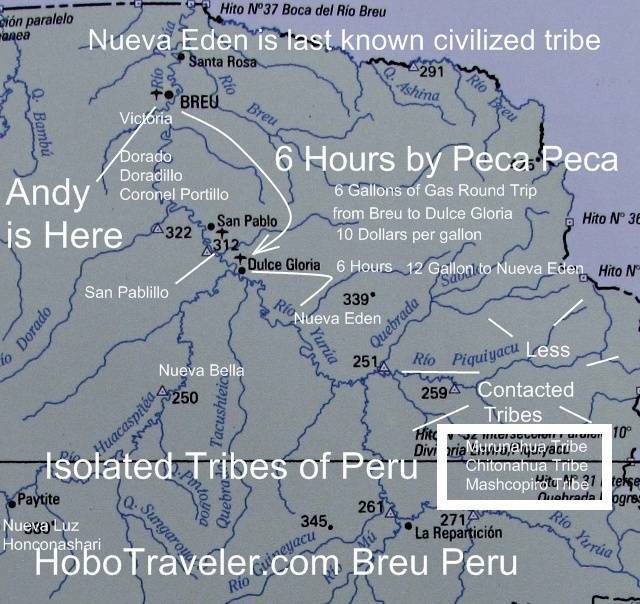 I am in Breu to investigate how to travel as close as possible to one of the isolated tribes of Peru. I will probably day a two-three day trip to Dulce, Gloria while I am here to discover the infrastructure of this village, whereby I can return in 2010 to further my studies, hopefully with some University types, who need an adventure outside the classroom. At this level of civilization on the planet we take big jumps down the ladder of civilization. When I leave Brue and travel to Dulce Gloria, I will enter a village that is 95 tribal in nature, while Breu is manufactured city by the country of Peru. There is a Military Base here with about 30 soldiers as we are about 2 hours by boat from the Brazil Border. As I travel up the Yurua River there becomes less reason to be there, and less civilized, until it is possible to enter an area where tribes live, however do not want contact by other people. About eight months ago, a couple of NGO fabricated a video that created a world wild novelty of the less contacted tribes of the world. Here in this community, they know the names of all the people who help pose for the airplane photos, the photos are on the bulleting board of the municipality of Breu. There is a lot of crap flying around, however what is real, there is an organized group of lumbermen who keep extending there reach farther into these isolated area. There is also a couple of highway being ran from Brazil into Peru. The misguide NGO, or ONG as they are called here are trying to use deceitful tactics to both stop the lumber industry, and increase their donation coffers. It is hard to say who is worst, the lumbermen or the NGO’s, the both will do anything to further their cause; nobody here is on the moral high ground. I reported on this about eight months ago. The only way to understand these isolated tribes is travel close enough to where the gossip ends and the truth prevails. I need to go about 12-15 hour by Peca Peca boat up river and I will truly be at one of the edges of civilization, after that, nobody know what is happen out there. I truly am grateful to the Peru Government for supplying a great outpost here in Breu, Peru for the study of one of our planets most isolated areas. This page is where I am collecting links and posting information.